Risk is a boardgame that I have played since I was a kid. It brings out the part in me that truly wants to be a military-ruling dictator. It’s one of those games that almost becomes less a game, and more an issue of male pride. I’ve found that parts of me almost shuts off and the game comes to life. It’s a very addictive game. Be forewarned I’ve found that the best players of Risk are women and they should be kept away from this game as much as possible. Risk is a game that divides the world into sections and each player must build up an army and conquer continents at the same time protecting your territory. One of the things to remember and it holds true in this game. 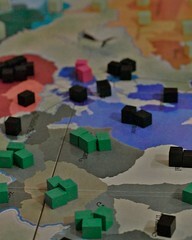 If you do decide to pick up the game of Risk, or if you already have it. Set aside a whole weekend to play because at times the games can carry over into days and even weeks of intense battle. It’s not for the lighthearted.